To avoid any confusion, this is the short-lived German band that released just two other LP's during their brief existence: 'Revelation' (early '71) and 'Thoughts' (late '71). Though they've been often tagged as a krautrock band, Virus is actually a hard rock/psych '70's ensemble that's from the Bielefeld/Westphalia area. 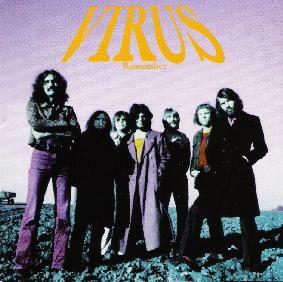 'Remember' was recorded at a live shindig in Koln on April 28, 1973 for WDR Radio show. The sound quality is like a 9.5, really nice. It appears that all but one of the nine tracks here are exclusive to this CD. Personally, I like it when bands like this play unreleased songs, that is if they're good. In the case of 'Remember', I doubt any fan of this genre would be disappointed. The first several tunes, "Everybody Knows That I've Got That Feeling", "This Is No Anarchy", the title cut "Remember" and "In Any Way", are basically high energy, very well played rock&roll. Some of the vocals sort of remind of, say maybe early Traffic, and the guitar of perhaps Ten Years After. "Rock 'N' Roll" is a very good bluesy rock number. I had listened to this release several times in a two day period as I noticed that the remainder of the disc "Settle Down", "Living In The Country", "King Heroin" and the ten minute instrumental "Woods Fun", had fully managed to keep up the pace. Great guitar and sax playing through most of the CD, with a total running time of 49:53. This disc would've made a great soundtrack for one of the 'Fritz The Cat' movies; you know, during the scene(s) where he's all flopped out in a garbage can after he gets like totally trashed. I believe the group had gone through a couple of personnel changes. The line-up on this CD is Jorg-Dieter Krahe-keyboards, Jurgen Schafer&Werner Vogt-bass and vocals, Reinhard Ifflander-guitar, Jurgen Dose-saxophone, Wolfgang Rieke-drums and Axel Nieling on percussion. Just might appeal to fans of Frumpy, Gomorrha, Uriah Heep and 2066 And Then.